If I can figure out how to add a picture, I will. Made the country loaves this morning. They seemed to hold their shape and were really easy to make. I thought they tasted great....was a little concerned about leaving the skins in the dough... I will make again. Your hint about pinching the seam helped me. They did not unroll. What do we make next???? And how exactly did you do that? I am only afraid of two things in the kitchen: folding egg whites into batter (I went through a few week period with horrible genoise experiences -- they broke my will) and filo (I'm too much of a perfectionist -- I see only my flaws). Sorry the ginger cake sucked. Maybe the babycakes would have turned out differently? If you subscribe to The Cake Bible theory, the larger cake might have had too much baking powder. Just a theory. I got over "egg white folding fear" by forcing myself to make things that require the technique. Don't add a lot of the whipped egg whites at a time and work slowly. I don't know if I should have posted this as a separate thread, but it seems to me this might be an appropiate place to ask this at this time. I have a recipe for a sponge cake that deflates in the center and I am suspicious of the double acting baking powder as the culprit. Otherwise I don't know what would have caused this. If anyone has a better recipe or a T&T I would be grateful. BTW, this came from Chocolatier a couple of years ago, other than that its a great cake. Today's therapy was two loaves of French bread from the Julia Child "The Way To Cook" cookbook. The house smells great. I feel better. There's something to be said about self-improvement through baking. Too bad computers don't have "smell-o-vision". PM me if you want me to help you figure out how to post pictures. 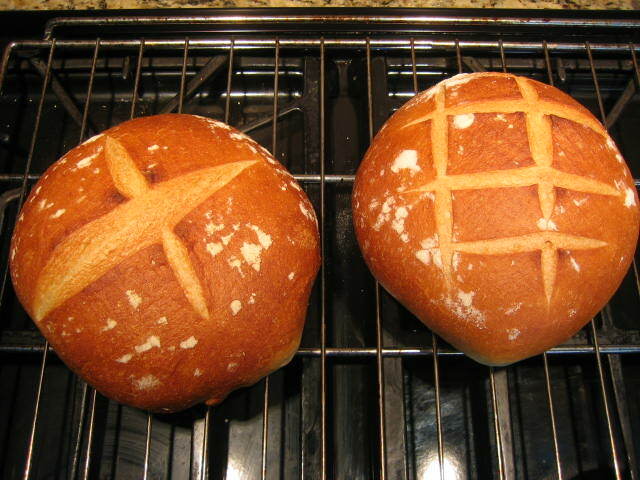 I am currently baking the mixed starter bread. I made 2 baguettes and 2 epis. I think that perhaps my new oven isn't getting as hot as it should and that's why my country loaves aren't working right. Gary, your loaves are so golden and gorgeous. Mine aren't browning that much. And, at least with the mixed starter loaves, taking longer to cook than the recipe states. Guess I'd better put that thermometer back in there. My loaves baked at 450 for about 35 minutes then at 400 for another 15 minutes. I threw in a half cup of water in the oven and closed the door to create some steam... right after the loaves went in the oven. I did it again at the 20 minute mark. The oil on my pizza stone smokes at 450 so I can't use it anymore. I baked these on a cookie sheet and the crust came out pretty good. thanks for the tempature information. My mixed starter loaves turned out pretty well, though a couple sorta deflated when I moved them to put them in the oven. I thought I was pretty careful. do you think they were overproofed? Anyway, they look gorgeous and taste delicious too. I'm particularly proud of the epis. I think I managed to shape them perfectly. Here's the picture (can't post to my eGullet photo album at the moment). Wadda ya think? Arbuclo, those epi loaves are gorgeous! Very, very professional looking. They look exactly like the loaves in a Paris boulangerie -- bravo! I didn't make the Nightcaps this weekend, but I did make the Double Chocolate cookies, because the latter were the kind of thing I could bake off and bring to my office. 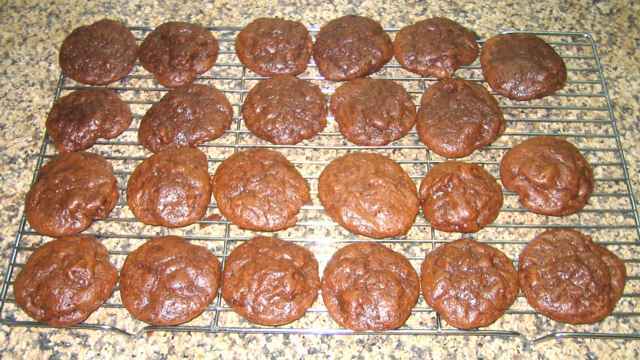 The Double Chocolate cookies came out great-- they have the texture and taste of a good brownie of the cakey (as opposed to fudgy) school. I might post a pic later. Wow, thanks, Dorie! That means a lot to me! I made the pita bread dough this week. I cooked up half of it the day I made it and only two of the eight pita's puffed up. I cooked them directly on my pizza stone. 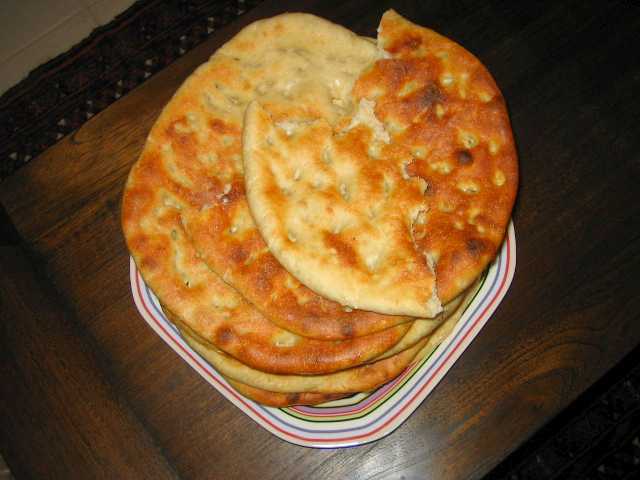 I have only made pita's once before(a recipe from epicurious) and had better luck. The recipe says you can keep the dough for a week in the fridge and use it as needed so I have half the recipe to use up. Just wondering if you have tried this recipe and have any tips for getting the pitas to puff up. The other recipe had the rolled pitas resting for 30 minutes before baking-would this help with Julia's recipe? A couple things about the recipe. I was surprised that my batter "collapsed" as much as it did when adding the chocolate. Also the description of how the bake up (puff, then sink, crinkle and wrinkle around the edges)...I didn't really think mine did that. That's why I like pictures with recipes, in case the description doesn't ring a bell with me. Seth, did your cookies look similar to mine? I thought I'd try the rugelach. Anyone else want to give it a try with me? I'd love to try making rugelach. However, my recipe is from the Village Baker's Wife. Anyone made them before? And, for the filling, besides the cinnamon one, I wonder if I can use the mincemeat (don't hit me!) I have soaking since Christmas? Gosh, I have no idea about rugelach. I've never even seen it let alone tasted it or made it! The BWJ recipe has a cream cheese pastry. 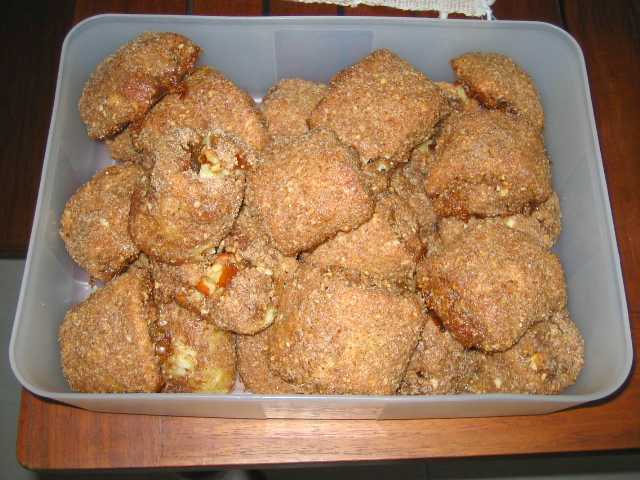 The filling is sugar, brown sugar, cinnamon, assorted nuts, assorted dried fruit, and apricot or prune preserves. I don't remember how much my batter shrank when I added the chocolate... but that always happens when you add stuff to whipped-up batters, so I don't think you did anything wrong, arbuclo. My cookies looked exactly like yours. Thanks for posting that pic, and sorry I was so lazy! I didn't really get the crinkle/wrinkle thing either, but they did puff and sink. 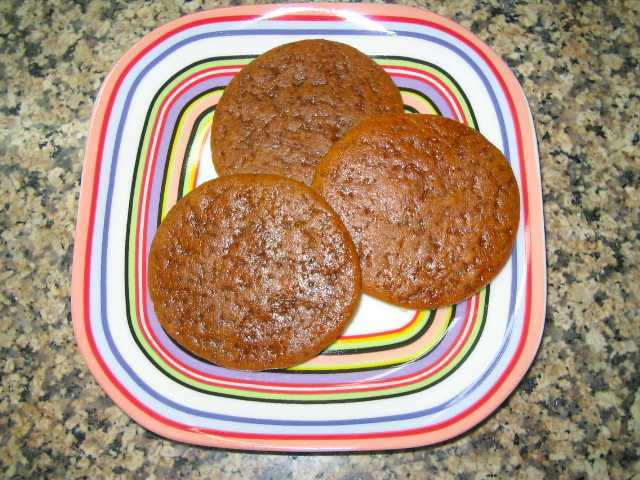 I thought the cookies were pretty forgiving, despite Dorie's warning that they are better under- than overcooked. My first batch was in for a few minutes longer than the second-- I was looking for the crinkle that never came-- and I thought they tasted just as good. Even though I cooked them the amount of time of the recipe the didn't get crisp. That was fine by me because I like soft cookies. These were great and I'd make them again. It's a little untraditional, but no reason you can't try it. Another good filling for rugelach is to brush the dough with melted raspberry jam and then sprinkle with chopped chocolate. oooh, raspberry and chocolate! I'm gonna have to give that a try too. I've got my rugelach rolled up (which is quite a task with all that filling!) and chillin' in the fridge. Will bake 'em tomorrow, and of course, post a picture. I love rugelach! I may have to jump back into this thread again with the rugelach mention. My rugelach is done. What a messy messy recipe! I haven't made such a mess in the kitchen in ages. These things are really good and why woudn't they be with all that butter and sugar?! What I found is that I couldn't really pinch the seams together when I rolled them up because there was too much filling. I didn't think anything of it because the dough still sticks together unlike a yeast dough. However when going to cook them the instructions say to stand them on the cut edge. When I did that mine just fell apart. On the second batch that I baked I put them on the seam side. I also had a lot of the coating left over (nuts, sugar and cinnamon) even though I felt I was quite generous when coating the rolls. I made the pebble bread again a few days ago. I do really like this recipe because it's fun to make the "pebble" impressions. It's a nice chewy texture too.